To transform your bedroom, bathroom or kitchen into a relaxing retreat. We have a range of offerings to suit your specific needs. 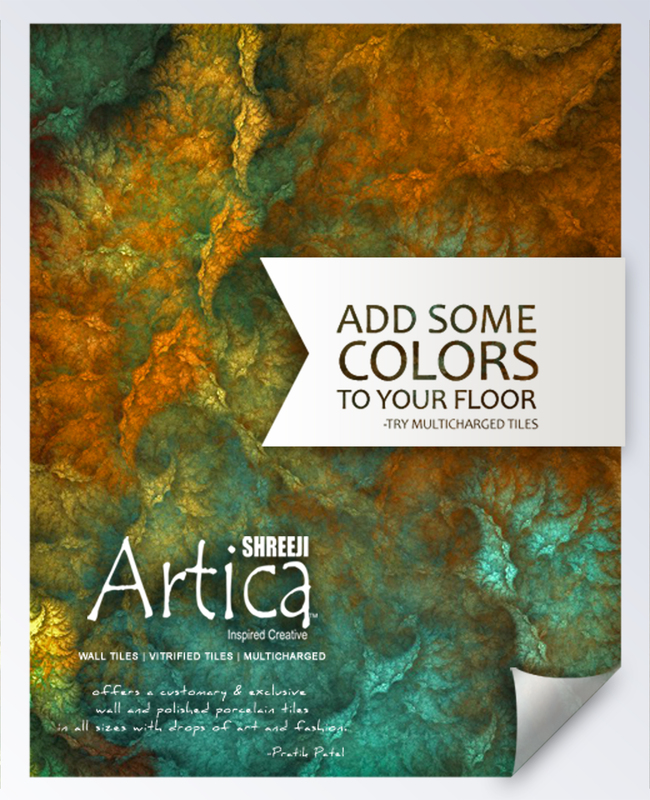 Shreeji Ceramic has developed first time ever ‘scented Ink Printing’ for wall tiles. Scented ink printing is one of our focuses, and a special digital-printing coating is applied to the tile with scented ink. 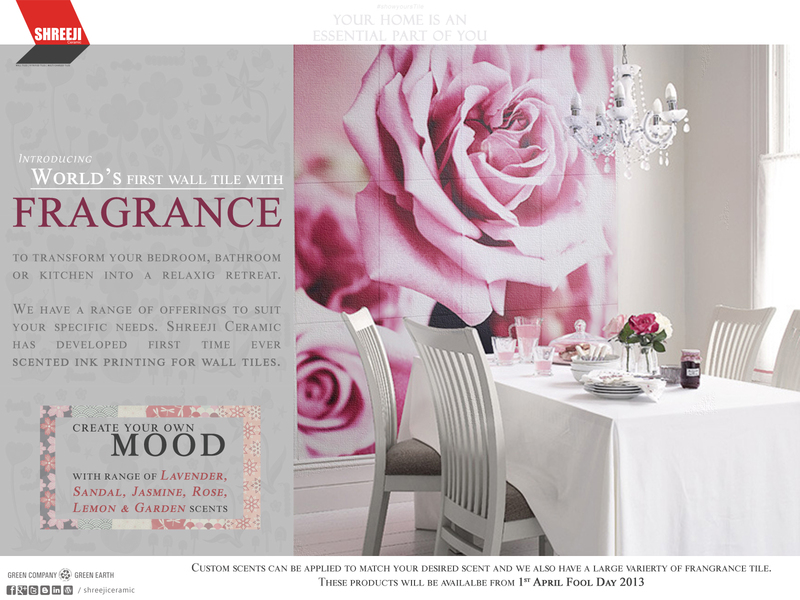 Custom scents can be applied to match your desired scent and we also have a large variety of fragrance tile. Today we are meeting the New Year 2012, and today we look into the future with greater confidence. The New Year indicates the beginning of a better tomorrow. From all of us at Shreeji Ceramic, best wishes of this joyous season! We hope this New Year bring happiness and fulfillment to you and your loved ones. It is only thanks to the munificent and reliable support of friends like you — from every part of India and from around the globe — that we can look back on a productive year. Every company has its own set of challenges and no one can disagree with that during the past year. We recognize the vast prospective of the ceramic industry in India and we are focused on maintaining a foremost position as a manufacturer of ceramic tiles in India. Our 12 years of practice in this business translate into a deep understanding of the industry dynamics and potential and reinforce our self-reliance in our upcoming success. We have experienced a phase of unexpected growth in the past twelve years. Our sales in the India have increased from less than one billion square meter in 1999 to about 8.3 billion in 2011-an enhance of over 730%. Factories based in the Morbi have a benefit of low energy costs, access to expertise and closeness to markets. This proximity enables the India based suppliers to rapidly counter to the market needs. It is my guess that there will be new, well-organized, and cost-competitive factories built by us in the India in the next few years. These will be world class plants and will compete on every basis: quality, design, service, and cost. Our new factory in Morbi is one such example. Its newly installed kiln, for example, can produce two times the output with less consumption and labour than kilns installed a mere 5 years ago. But there are challenges. The past and predicted expansion of the industry along with the new channel of distribution being developed requires that those of us in the ceramic industry invest in ourselves. We need to educate our employees and ourselves and to keep current on expertises and trends. To stay undeveloped is to fall behind. I urge all of you to stay involved with our associations, support and attend educational opportunities from all sources, and attend trade show, such as Cevisama – Spain. Through these mediums we will all help to grow our industry and to achieve our profit goals. As head of the Company, I take pride in what we have achieved together through the year 2011, as much as in what each and every one of you have demonstrated and become. I thank all our customers for your fortitude and understanding. As the New Year is drawing near, on behalf of the Company I would sincerely extend my gratitude and give my best regards to all of you and your families. 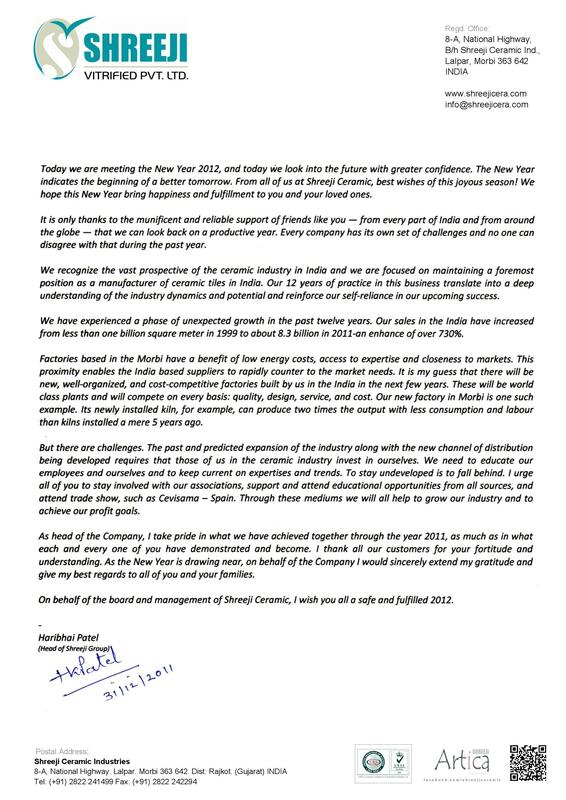 On behalf of the board and management of Shreeji Ceramic, I wish you all a safe and fulfilled 2012. Idyllically, the festival of Holi is meant for a joyous celebration with carefree attitude. It is done in order to greet the colors of spring. Though, unfortunately the meaning of Holi has not remained the similar in last few decades owing to the ruthless commercialization and source of hazardous Holi products. So, unhappily the modern Holi does not stand for everything beautiful. In fact it has become yet another source of environmental degradation. To de-pollute Holi and evoke in again into an environment friendly fiesta, a lot is required to done. In this article we have mentioned certain ways in which you can do little steps from your side to change the Holi in your locality into an ECO FRIENDLY HOLI. Holi being a social celebration is not limited to one home, so in order to convert it into an environment friendly festival, contribution is required from every family of the society. SHREEJI’s dream of eco friendly and non-hazardous Holi can be true only when every individual who participates in the festival, do maximum efforts from his/her side not to hamper the environment in any way. For this, mass level awareness of people regarding an environment friendly celebration is required. People need to understand that if some little changes in the celebration pattern can bring worth results for the environment, how they can then shift towards the change in the social sector. In a situation when most of the Indian cities are facing acute water scarcity, it is obviously a matter of concern that the precious commodity like water is being wasted in such manner during the Holi celebrations. On the day of Holi, people out of enthusiasm and fun saturate each other with buckets of water and children throw water balloons at each other, thus the water that could have used for next few weeks is finished in a day creating more difference in the demand and supply of water. Though, if we just people to celebrate a dry Holi only with ‘Gulal’, it would seem an unfamiliar concept to most of the people. Though this celebration would have been ideal but as most of the people would not agree to it, the judicious use of water on the day is one thing that must be kept in concern if you wish to celebrate an eco friendly Holi. In ancient time, the Holi colors were prepared from the flowers of trees like Indian Coral Tree (parijat) and the flame of the Forest (kesu). However, with the influx of dry chemical colors, people stopped taking pence for extracting the flowers colors and with time the use of chemical and aluminum paints increased during the celebrations. These chemical dyes not only prove extremely dangerous to individual’s skin but are also hazardous for environment as lots of pollution is caused during its preparation as well as after their mergence with water cycle. The burning of fuel wood in order to perform the Holi Bonfire or the Holika Dahan presents is another factor related to Holi that raises a factor of concern. Umpteen useful fuel woods is wasted during this ritual, this not only leads to the cutting of trees but also unnecessary pollution in return. Instead of wooden logs, it would be ideal if people use this Holika Dahan for burning their waste material. But when there is fun and festivity, it is so easy to get carried away. However, why risk your life and nature for short-lived exhilaration? With best regards, SHREEJI ceramic wishing you all a joyous and vibrant ecofriendly Holi. >While using ceramic tiles of the same type, size and finish, some floors and walls achieve a strong impact and are capable of making a significant contribution in terms of architectural quality, while others go totally unnoticed. What is it that makes the difference? The quality of the project. It might sound obvious, but it is not. Here, we have frequently pointed out that Shreeji ceramic tiles are unique amongst floor and wall covering materials for their ability to combine aesthetic and technological qualities. This means not only high performance characteristics, which can be measured and certified by means of comprehensive standards, but also the intrinsic characteristics of the production process which a number of very different qualities to be combined in a single tile. At the same time their characteristics of the functionality and durability allow them to perform their functions to perfection. Ceramic tile is a sustainable product, whose environmental impact over its entire lifecycle from raw materials quarrying through to industrial production, demolition and disposal of debris has been drastically reduced over the years. This is a result of intensive technology and plant engineering innovation promoted by Shreeji ceramic. So while there are no doubts about the quality of the materials, designers must be aware that each individual product has to be specified and installed to the highest standards if its aesthetic and technical potential is to be fully harnessed. The role of designers is therefore not limited to product selection.